The ability to communicate across heterogeneous environments. The ability to serve a growing number of clients without degrading system performance. The ability to quickly develop robust data access applications using ADO.NET’s rich and extensible component object model. An improvement over previous ADO versions due to the disconnected data model. All communication involves data exchange, whether the communication between distributed components is through a request/response methodology or a message-based facility. Current distributed systems assume that the components involved in the communication are using the same protocol and data format. This assumption is too restrictive for a client base to expand across an enterprise or for multiple companies. Data-access layers should impose no such restrictions. In current Microsoft Windows Distributed interNet Applications (DNA) Architecture, application components pass data back and forth as ADO disconnected recordsets. The data-providing components, as well as the data-consuming components, are required to use the Component Object Model (COM). The payload, the actual content we are passing around, is packaged in a data format called Network Data Representation (NDR). These NDR packages are streamed between components. There are two issues with current Windows DNA systems. The first is the requirement that both ends of the communication pipe have the COM library. The second issue is that it is difficult to set up and manage these communications across firewalls. If your middle-tier components are COM/DCOM-based and you are using them within your intranet, you are in good shape. To put it another way: if all your components use Microsoft technology, you’re fine. With the advent of electronic commerce (e-commerce), however, enterprise applications must interoperate with more than just Microsoft-development shops. ADO must improve for cross-platform components to seamlessly share data, breaking away from the limitations of COM/DCOM. ADO.NET addresses the common data-exchange limitation by using XML as its payload data format. Since XML is text-based and simple to parse, it’s a good choice for a common, platform-independent, and transportable data format. Furthermore, because XML is nothing more than structured text, employing XML as the data format on top of the HTTP network protocol minimizes firewall-related problems. With ADO and its XML format, the clients do not have to know COM to de-serialize the packaged data. All they need is an XML parser, which is readily available in many flavors on many different platforms. The data producers and consumers need only adhere to the XML schema to exchange data among themselves. In a client/server model, it is typical for a client to acquire and hold onto a connection to the server until all requests are fulfilled. While this solution works fine in small- to medium-scale applications, it is not scalable across a large enterprise. As soon as the number of clients reaches a certain threshold, the server becomes the bottleneck, as database connections eat up network and CPU resources. ADO.NET moves away from the client/server model by promoting the use of disconnected datasets. When a client requests some data, the data is retrieved, it’s transferred to the client, and—as soon as possible—the connection is torn down. Since the connection between the client and the data source is short-lived, this technique allows more clients to request information from the server, thus solving the problem of limited connections. You might think that setting up and tearing down connections is not a good idea since the cost of establishing a connection is usually high. This is a concern only in the absence of connection pooling. ADO.NET automatically keeps connections to a data source in a pool, so when an application thinks it is tearing down a connection, it’s actually returning it to the resource pool. This allows connections to be reused, avoiding the cost of reconstructing new connections from scratch. Working with data in this disconnected fashion is not new to ADO programmers. The disconnected recordset was introduced in early versions of ADO. However, in ADO, it is up to the developer to implement this feature, whereas in ADO.NET, data is disconnected by nature. ADO.NET has enhanced its predecessor by growing out of the client/server model and into the distributed components model. By using disconnected datasets as the paradigm for data exchange, ADO.NET is much more scalable than its predecessors. ADO.NET’s rich data access classes allow developers to boost their productivity. Current ADO developers should have no problems getting up to speed with the object model, because ADO.NET is a natural evolution of ADO. The core functionality remains the same. We still have the connection object, representing the pipeline through which commands are executed. With ADO.NET, the functionality is factored and distributed to each object in the model—much better than in previous versions of ADO. For example, the connection object is responsible only for connecting to and disconnecting from the data source. In ADO.NET, we can no longer execute a query directly through the connection object. Although some developers might miss this ability, it is a step in the right direction for cohesion of component development. Along with the familiar connection and command objects, ADO.NET introduces a number of new objects, such as DataSet and DataAdapter. All of these objects are discussed earlier in this chapter. ADO.NET also boosts developers’ productivity through extensibility. Because ADO.NET framework classes are managed code, developers can inherit and extend these classes to their custom needs. If you prefer not to do this low-level legwork, you can use the Visual Studio. NET data-design environment to generate these classes for you. Visual Studio .NET is a great Rapid Application Development (RAD) tool for developing applications with ADO.NET. You can have the Component Designer generate ADO.NET typed DataSets. These typed DataSets are extended types, modeled for your data. You don’t have to reference database fields by their names or indices but instead by their names as properties of typed objects. For example, instead of oRow(customerName), you can use oRow.customerName. The generated code is much more readable, when compared to previous Microsoft code generators. In addition, these generated classes are type-safe, thus reducing the chances for errors and allowing compilers and the CLR to verify type usage. In short, ADO.NET improves developers’ productivity through its rich and extensible framework classes. These features are complemented by the rich toolsets for ADO.NET in Visual Studio .NET, which enable rapid application development. Because ADO.NET is mainly about disconnected datasets, the system benefits from improved performance and scalability. The database server is no longer a bottleneck when the number of connection requests goes up. Data Providers in ADO.NET also enable implicit connection pooling, which reduces the time required to open a connection. Previous marshaling of recordsets required type conversion to make sure that the data types were all COM-based. Since the disconnected dataset is in XML format, there is no need for this type conversion during transport, as opposed to dealing with data in Network Data Representation format. With the ADO.NET architecture, the data providers can be optimized for better performance by talking directly to the database server. .NET Framework Data Provider for SQL Server is an example of this as we can see later in this chapter. Returns Object as a Result. (Count no.of items in a perticular Column). Excute selecte statement and returns DataReader as a result. 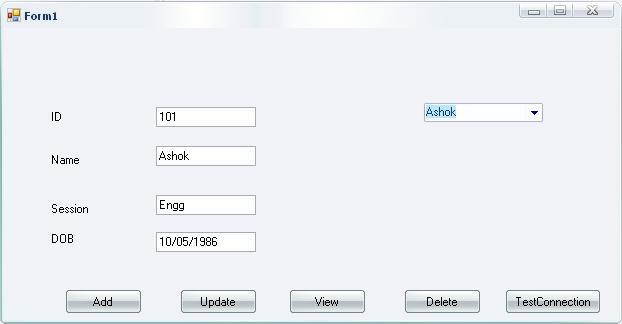 step 2.Open VS 2008 and create new project(Windows form) named DbTest and design the form as given below. Data access namespaces and Objects in.Net..
ADO.NET has a Connection object, Command object, and Parameter objects (actually implemented by the SqlClient, OleDb and Odbc .NET Data Providers), however, they don’t have the same properties, methods, or behaviors as their ADOc counterparts. 1. This object model could be used even for non RDBMS products. We can read data from xml excel files also. 2. ADO objects are dependent on OLEDB providers and OLEDB providers would connect to the back end. 1. It is not an enhanced version of ADO. Its a new object model which has some objects similar to ADO. 2.In ADO.NET we use Managed Providers.